I post a lot about taking Epsom salt baths when I am sore or tired, (which is a lot!). I even talked about them in the August 2015 edition of FitnessRx for Women. But I ALWAYS get asked if it really works. The best way I can answer that is that it ABSOLUTELY does work for me! But like most things in fitness, just because something works for someone else, it doesn’t necessarily mean it’s going to work for you. So, the only way to find out is to give it a try. 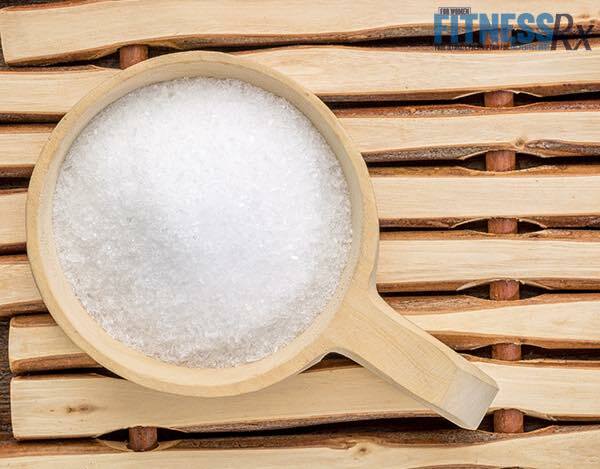 What are Epsom salts? They are actually the mineral compound magnesium sulfate, which can easily be absorbed through the skin, making Epsom salt baths a good idea. Magnesium itself does a number of things in your body, like regulating enzymes, reducing inflammation, helping with nerve and muscle function and much more. Our bodies can easily be depleted of these minerals, especially if you sweat a lot, so this is a great way to replace them, promote recovery and help flush toxins. They’re kind of like the duct tape of the bath world; they do SO many things, the list is endless— from headaches, to fatigue, muscle soreness and constipation. Personally, I use them whenever I am sore or after a tough training session, like on leg days. I also use them when I am feeling a little run down or feel a cold coming on, and it almost always makes me feel better the next day. The magnesium is also going to help you sleep better, which is why I like to take one right before I go to bed. I even add essential oils like lavender to help relax me even more. Here is what you’ll want to do— start by buying some Epsom salts; you can find them usually at any grocery store, pharmacy, Target, Walmart, etc. You can buy the most generic bag there or opt to spend a little more on brands like Dr. Teals that have some nice scented options, which is nice if you aren’t planning on adding your own oils. The next key to a good soak is to make the water as hot as you can stand it without hurting yourself— the more you sweat, the better! Add at least two cups of the Epsom salts to your bath and you are ready to soak. At this point, you can also add in any extra oils you’d like as well, but be careful with them. I once added lemon oil and it burned my skin in a few spots, so I just stick to lavender now— it works best for me. Try to soak for a minimum of 15-20 minutes; if you can make it longer, great! Some people can’t stand the heat or they just don’t have the time, but like with anything else, something is better than nothing. So stick it out as long as you can. Also, make sure you have plenty of water to drink while you’re in there because you will get thirsty, and you want to stay hydrated and keep things flushing! Once you get out of the tub, try not to cool down right away— you may actually want to put on a robe or some loose sweats to allow your body to keep sweating. You don’t have to do this all night, but at least for another five to 10 minutes if you can manage. And that’s it! You’ll want to pay attention to how you sleep that night and how you feel the next morning overall. Less sore? Refreshed? Rested? Does your skin look or feel better? Anything you notice that is different from the day/night before will help you figure out if it works for YOU! Have any more questions about Epsom salt baths? Let me know, I would be happy to help get them answered!